Jakarta, 2018. Technology Workshop: Reservoir Modelling on EOR Field is one of Indonesian biggest workshop organized by Society of Petroleum Engineers Indonesian Student Chapter in collaboration with Schlumberger. 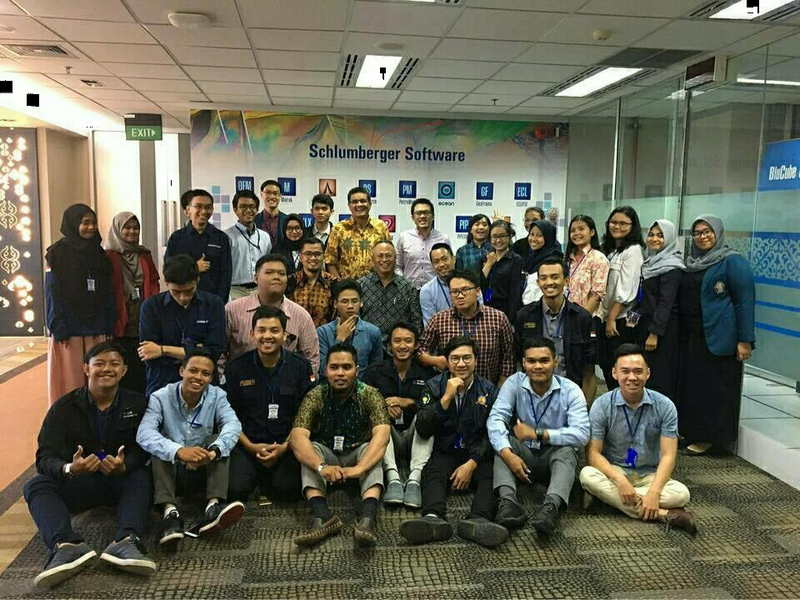 This event was held on Thursday-Friday (January 31st – February 31st, 2018) at Sapphire room, Sclumberger office. Mr. Avidianto Suryo Setiawan (Reservoir Engineer at Carigali-PT TEPI Operating Company Sdn. Bhd. (CPOC)), Mr. Yanuarius Gandung Prabowo (Senior Reservoir Engineer at Sclumberger Information Solution), Mr. Mohammad Arief Darmawan (SIS Service Manager), Mr. Luky Hendraningrat, Ph.D (Principal Reservoir Engineer (EOR Specialist) at Auroris Management Group and Mr. Wicaksono (Head of Reservoir Engineering Department at PetroChina Int’l Jabung Ltd) was the speakers for the workshop. The total of participants were around 26 participants from any kind of major and all over university in Indonesia. On the first day, Mr. Avidianto was sharing about basic concepts and techniques of Enhanced Oil Recovery (EOR). EOR itself can be defined as a method that could improve the recovery factor after primary and secondary recovery is done. There are several methods in EOR, generally, thermal oil recovery, miscible gas injection, microbial processes, and chemical flooding. Things that should need to considered to implement EOR methods is based on screening criteria. After that continued by Mr. Gandung that who talk about Petrel PE, Eclipse, and Intercept. One way to build and simulate a model of reservoir is using a software. Petrel is used for Pre-Processor make a grid, fluid properties, type output, and well controls, while Eclipse is used for simulator / processing (solving equation) and Intercept is used for post processsor (tool for analysis and visualization). Intercept is also used in simuation with high resolution. Then, sharing about Nano EOR by Mr. Luky. The Idea from Nano EOR is by injecting something that much smaller than pore throat to displace more oil. Ultra small size by Nano can easily be manipulated so it would be improved recovery factor with low risk. After the material on the first day is completed, it’s time to case study. 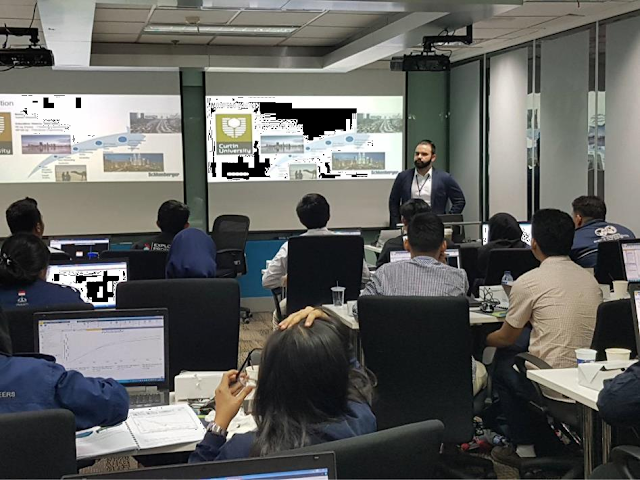 This case study is guided by Mr. Agus and the participats who has been divided into groups should perform a reservoir simuated using Petrel PE. Case study for the first day is limited to initialization which are create the initial condition of the reservoir based on data form G&G so that it accordance with actual condition, history matching is a validation data (the data that used for validation is production data), and the last is a production prediction (forecast). The second day as the last day for this workshop begun by continuing the case study that guided by Mr. Gandung. The case study focuses on reservoir simulation with EOR Injection on several technique are water flooding and chemical flooding (Surfactant, Polymer, and ASP (Alkaline, Surfactant, and Polymer)) using petrel PE. 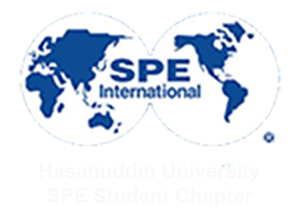 Hereinafter, the presentation from Mr. Muhammad Arief Darmawan regarding Petroleum Industry Outlook. “Where the best place to find an oil? Where the oil is” he said. Today, Indonesia has a lot mature field or decline production well while is difficult to find new resource. To overcome that matter EOR method is needed. EOR method itself is succesfully done in Indonesia is on the Duri field. The last material on this workshop is Enhanced Oil Recovery: CO2 Injection by Mr. Wicaksone. CO2 Injection is a popular method that is used in the world to improve recovery factor. This is caused by CO2 itself is a residual saturation of oil post secondary water flooding. In Indonesia, the challenges faced when implementing CO2 flooding is most reservoir preassure that has depleted. This condition become a serious problem especially for a miscibe mechanism, whereas the mechanism can give more oil recovery than immiscible ones. The last event this presentation of the participants about case study that has been done. Although, it has the same results yet each group can present different interpretation according to their resprective. In the end, this workshop is a great platform to share knowledge and got amazing experience. Hope this event will be held again said one of participant workshop.